High school is hard for Kayano. When she tries to confess her love to the kind but distant Yuichi, the school bully Takeru makes her life hell. But things get worse when Kayano's mother gets engaged to Takeru's father, the school principal! Soon enough, instead of be in love with Yuichi, she falls in her love with her future brother, Takeru. What will she do about this forbidden love? 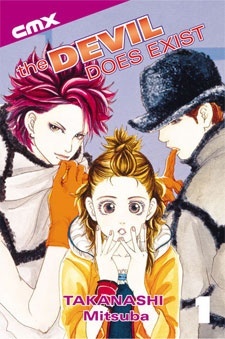 Akuma de Sourou was published in English as The Devil Does Exist by CMX from April 1, 2005 to August 8, 2007. For starters, I actually think that this scenario is very likely to happen in real life, but this author has such an original way of telling it, I recommend this Manga for those of you who like tabooed love. I feel that both the beginning and especially the ending were a little rushed. The introduction of characters were fine, but the character development happened too quickly. The ending had many gaps and much more could have been added to the story, but don't let that discourage you from reading it for yourself. Story:It was a pretty generic shoujo manga story but if you like shoujo then you'll enjoy it. However, it was kind of a depressing story for me overall but that seemed to give it a sense of authenticity. Art: Well everyone looked way to similar for my taste but otherwise the art was pretty great. Especially all the extra pages, they always had really intricate clothing (the art in the actual manga was not to complex). Character: Main characters seem to have the usual shoujo boy and girl types. Characters not overly developed but you can get a sense of what a persons reaction would be after awhile. Side characters had no depth. Maybe the character development was hard to tell because of the translations. Enjoyment/Overall: I gave this an 8 because I really did enjoy reading most of The Devil Does Exist. Forbidden love is really nice to read about sometimes and the ending is quite moving for me. I'm still upset. So overall I give it a 7 because it was a nice short series to read for a day, but definitely not a masterpiece. Story: The story was written wonderfully. The author made it really realistic; I could see it happening in real life, because it gave so much details and information about how the person felt and how the other felt. The situations that were in the story were very good too, because as I wrote before it was realistic. I haven't ever come anything like this either so I thought it was very original and enjoyable. Art: The author did a good job on the art too; the characters didn't look much the same and the scenery was beautiful. It had everything you could see in real life. However, sometimes the characters did have the same look just one or two of the characters though, which was sort of annoying to me.. but yeah it was good. Character: Oh, I think this was the best part in the story. I loved seeing the characters developing! Especially how Takeru and Kayano were developing towards each other, but it did go a bit fast how Kayano got to like Takeru like that so fast.. nonetheless there wasn't anything too rushed after that at least in my opinion. Overall: I don't think the story could be written any better. I have to accept that at the beginning i did not think that this manga was going to be good, the synopsis that they have written for this manga is not really exiting. However, when i got pass the first chapter i really began to enjoy the story. I think the main reason why i really liked the manga was because of takeru, the male character. He is the sort of tough person, who has a tough appearance, but when we begin to know him, he is sweet. I read it in 1 day, it was easy to follow and enjoyable. It isn't one of those stories which drag on and on the plot. The number of chapter were good ( not too much, not too little). So if you like shoujo and romatic comedies I think that this would be the perfect manga for you.